We've written about the very cool blog "Mapstalgia" before, where Josh Millard is collecting drawings from users who re-create levels from their favorite video games from memory. 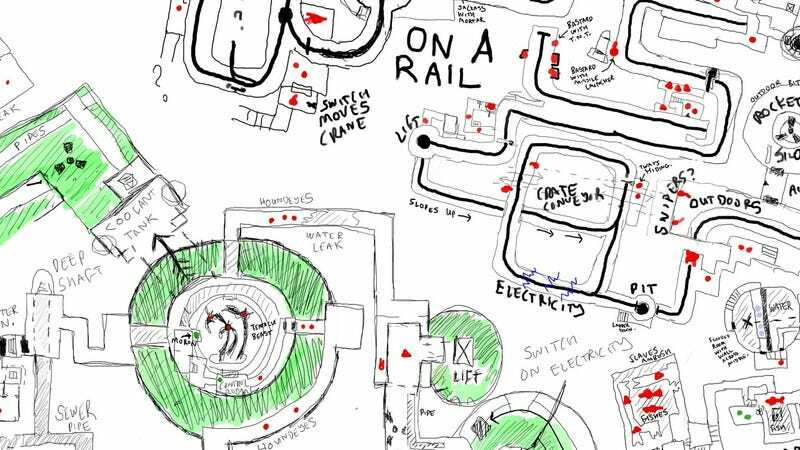 He's still at it, and has added a whole bunch of new maps, from Tony Hawk Pro Skater to Halo: Combat Evolved to the below map of the first eight levels of Half-Life as drawn by user Corinthian. Man, that Corinthian fellow sure has one impressive memory! He even remembers where the enemies were. I think my own recollection of the first eight levels of Half Life would be pretty vivid up until the part where the scientist falls down the elevator shaft, then it would sort of fall apart. Check out the full drawing below, or view the high-res version here. They're still taking submissions, so break out your pen and paper and go send something in!